Keep your grill looking like new with the Weber Porcelain Enamel Grill Maintenance Kit. 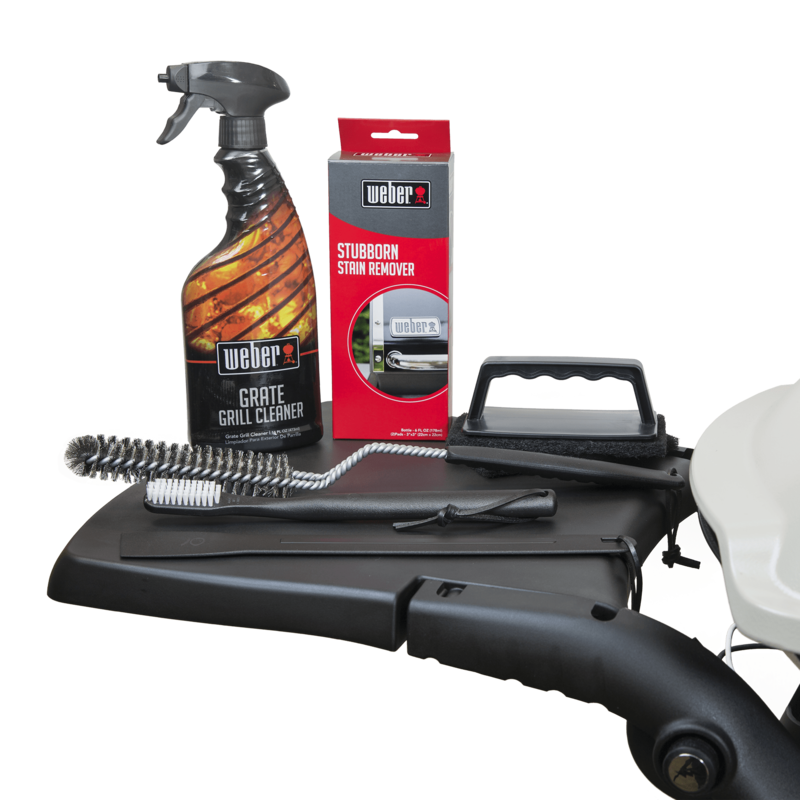 The kit has everything you need to keep your grill as shiny as the day you bought it and is safe to use on all Weber grills with porcelain-enamel exterior finishes. Kit includes: Grate Grill Cleaner, Grate Scrubber with five scrubbing pads, Spider Screen Brush, Stainless Steel Bristle Brush, Cookbox Scraper, and Exterior Grill Cleaner. Weber® Porcelain Enamel Grill Maintenance Kit is rated 4.9 out of 5 by 16. Rated 5 out of 5 by AlanG from Everything you need to keep grilling cleanly! We have an old Genesis grill dating back to the early 2000s. It was in bad need of a complete cleanup. Buying this kit made the job a lot faster and safer. The kit supplies all needed cleaning brushes and scrapers as well as the grate cleaner and exterior cleaner. The grate cleaner is especially effective in removing cooked-on fat and grease. After two separate days of cleaning our grill, it now works just as it did several years ago, before it was put aside for personal reasons. 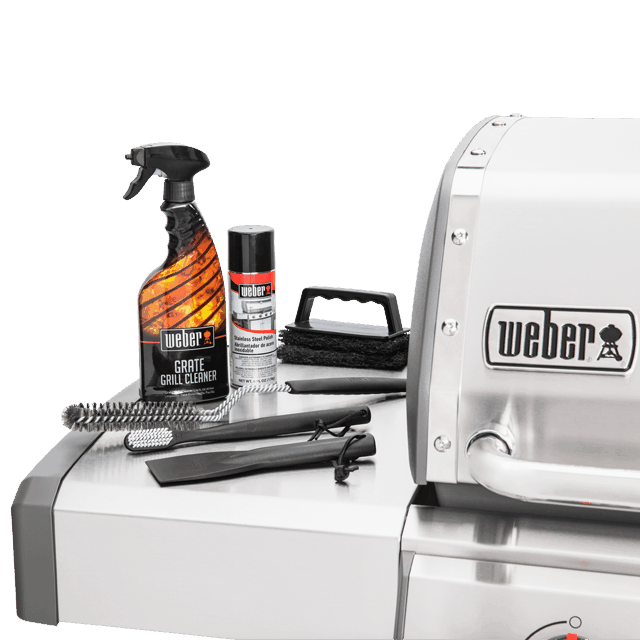 You could not find a better product for cleaning and restoring Weber grills anywhere. This will be your best bet for a serious cleanup and maintenance system. Rated 4 out of 5 by Eapples from An All-in-One Kit So far, I've used the kit twice. The first time, I didn't realize how caked-on all the gunk was. The second time, I attacked everything using the kit, and my pressure washer. The grates came out as clean as they could get, given their usage and age. I did the exterior of the grill itself by hand, without the pressure washer. If you follow the directions, the exterior does come surprisingly clean. Given the age of my grill, I was impressed. Rated 5 out of 5 by Gilly1161 from Work very good I received this item a week ago. Had used my Weber grill a half a dozen times before I really cleaned it. Used the cleaning kit and it removed all the burnt on sauces and grease. It almost looks new again. Grates are clean inside walls and bottom of grill grease is gone.